Most American bibliophiles have missed the boat on reading The Groaning Shelf; it was published by Hachette in India in 2010. I recently traded duplicate copies of two books in my library for a copy inscribed to me by the author himself. And I'm glad I did! 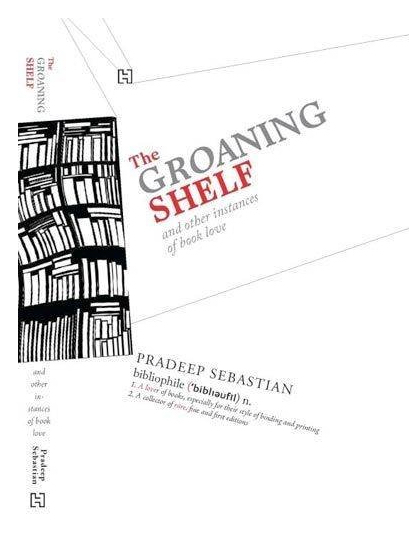 Pradeep Sebastian, author of Endpaper, a column about books which appears in The Hindu, wrote The Groaning Shelf primarily for the bibliophile in India. But bibliophily has an international flavor, as evidenced by the titles used in this book: The Pleasures of Bibliophily, The Browser's Ecstasy, Editions, A Gentle Madness, The Book Eaters, Writers, Ruined by Reading, Loved and Lost, and Bookstores—and those are just the titles of the sections! Here are some of the titles of the 53 essays: Shelf Life, The Bookman, The Mystique of First Editions, For the Cover Alone, True Tales of Bibliomania, Marginalia (& Other Literary Curiosities), The Book Borrower, A Hitchhiker's Guide to the Library, A Genius for Suspense, Reading in Bed, Lost Books, At the Museum of Books, The Ultimate Bookshop, and The Book in the Movie (extra kudos for the last one). Pradeep closes his book with an afterword about attending the New York Antiquarian Book Fair in 2010 and meeting Rebecca Rego Barry, editor of Fine Books & Collections, and Nicholas Basbanes, "the collector of collectors," at the book signing table. In his inscription, Mr. Basbanes referred to Pradeep as "his colleague in India, and a fellow chronicler of the gentle madness." A small number of copies of The Groaning Shelf are available online. Several booksellers in the UK list Mr. Sebastian's book for $6 plus shipping. Amazon has two copies listed for $255 each (not a misprint). And Alibris currently has a copy listed for a whopping $435.90 plus shipping. Hachette has an ebook version, which is available via Barnes and Noble's Book Nook for $12.99. In this bibliomaniac's opinion, Hachette would do well to have one of its American book publishing groups publish a hard copy of The Groaning Shelf —expressly for those American bibliophiles who prefer "book in hand."